You will love this spacious Complete Drywall 3 bedroom Home with 2 full baths. You have a Large Master Suite with a Huge walk-in closet and Private Master Bathroom with Linen Closet. Large Step down Island Kitchen with White Cabinets and All Black appliances even Microwave, lots of cabinet space and Large Pantry. Wonderful Open Living room great for entertaining. Large Front Deck to relax on, Central Air, and site can accommodate a 2 1/2 car attached garage at an additional cost. Meadows Of Perrysburg is a gorgeous community that will make you feel like you are on vacation all the time. You have to stop out and see our resort style community. Meadows Of Perrysburg is a wonderful place that you would be proud to call home. 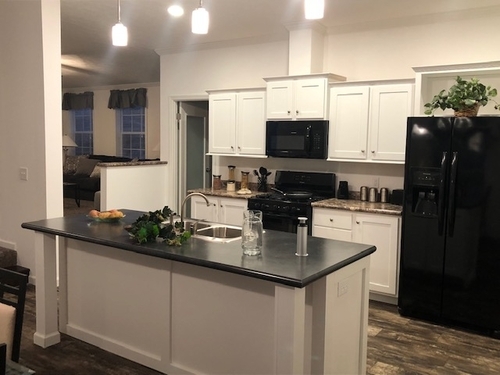 We give you the most affordable Housing Option for Brand New Homes in Perrysburg, with Top notch Rossford Schools this is a great place to raise a family. Our Community offers... A Large Swimming Pool with sun bathing Deck. A Private Neighborhood Play area - Your Kids or Grandkids will Love Playing on the playground we also have a basketball Court and Sand Volley Ball.You have the option to use our Community room for Large Parties. Your Garbage removal is included & We have Great Community Parties throughout the Year - we offer you way more than just a home. If you have a Boat or RV, we have FREE storage. We even have a Great space for your furry friends to run around. * Important due to our policy of continued improvement, all information in our brochures and photos may very from actual home. The right is reserved to make changes at any time,without notice or obligation, in colors, materials, Prices, specials, specifications, processes, and models. All dimensions of square footage calculations are nominal and approximate figures. Please check with your sales associate for specific and current information.